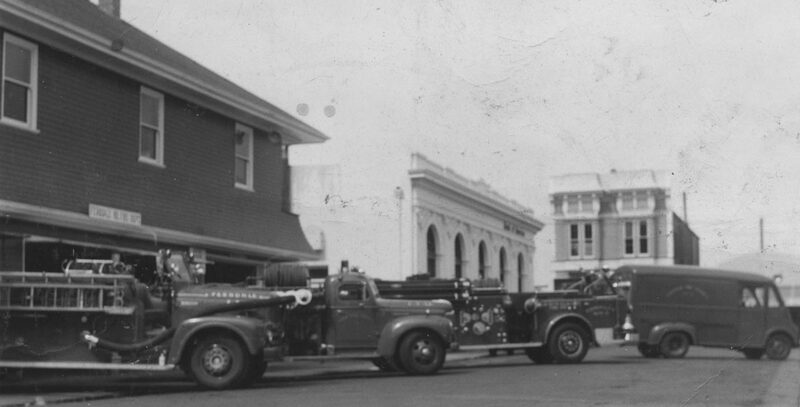 On this site we refer to this engine as a 1955 American LaFrance, as it was purchased and delivered in 1955. The VIN number of the engine however indicates it is a 1953 model, which is odd because the engine was built to spec. The proposal below was made Dec. 9th, 1954, and the county approved the purchase in Jan. 1955. The engine was delivered in Aug. 1955. Original cost was $16,350. 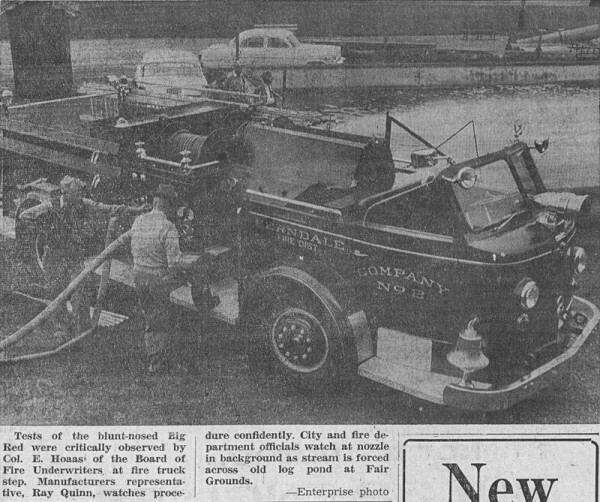 Added fire protection will be given the Ferndale Fire District in July with the arrival of the latest type of fire fighting equipment manufactured by American LaFrance Foamite Corporation. Commissioners of the Ferndale district made the final decison to purchase the equipment this week after purchase was authorized by the Humboldt County Board of Supervisors. Ferndale firemen, who are to operate the new equipment, set up details on the type of equipment needed for the valley district's fire protection. The new truck will replace the present American LaFrance pumper owned by the district. The latter has served the district, including the city of Ferndale, continuously since its purchase in 1937. The new pumper to be delivered in July is an Invader Pumper 750 and capable of delivering 750 gallons of water per minute. It will also deliver 600 pounds pressure on the booster lines. 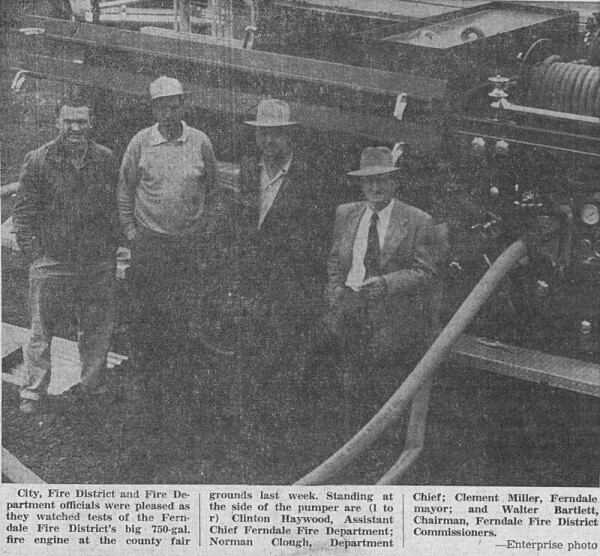 The high pressure feature is said by firemen to add considerably to water supply and the effectiveness of the "fog nozzles" used so frequently by the local department both in extinguishing confined fires and in giving protection from heat and flames to firemen handling the nozzles. Design of the truck is a "cab-ahead-of-engine" type giving a a greater angle of visibility to the driver. It is said to be 15 times safer than the conventional driver's seat. Turning radius is listed at 25 feet right or left. Seating capacity, in addition to the driving seat, provides for five men in side-entrance seats. This is to eliminate the practice of riding the side steps. The truck will carry a 400-gallon water tank. The new equipment will cost the fire district $16,350 plus $490.50 state sales tax delivered in Ferndale. The next best bid for similar equipment, a Seagrave build truck, came to approximately $18,200 delivered here. The first photos of "Big Red" show up in the Aug. 12th edition of the Ferndale Enterprise. This engine is still owned by FVFD after being sold off then re-bought by members and eventually donated back to the department. The bell you can see in the first photo was moved to its replacement, the 1977 Howe engine, and then again to the current Engine #2, the 2005 Spartan. The current restoration goal is to get new tires and brakes installed so that is will be rolling stock and can be used for fire truck rides on the Fourth of July. This pumper is powered by a Junior V-12, with redundant starters, plugs, and distributors.